Now includes HD 1080p free footage. Updated July 2015. The failing still images and link to high quality video footage have been corrected. of Jan Ingenhousz's work first reported in 1784. At present he may have been incorrectly assigned priority over Brown. An occasional series which encourages you to explore in close-up the everyday things around your home, garden and garage. Updated October 2000 with new video footage. in this June 2009 Micscape article. Update 2013: HD 1080p footage (45 second) demonstrating Brownian motion in dilute milk added. Right mouse click this link to save the 250 Mb file in Quicktime mov format to PC. Do not directly click link to try to play such a large file in browser. File details: Darkfield illumination, 40X objective with 10X eyepiece, total mag 400X. Camera Canon 600D. Horizontal field width 118 microns, typical fat globule size range 0.5 - 3 microns. Free to use for personal and group educational purposes 'as is' or edited if credit to 'David Walker, Micscape'. Further distribution or commercial use not permitted without permission. Email contact at article base. Maurice Smith's article 'Nature's Little Helpers' in the November 1997 issue of Micscape prompted me to spend an afternoon seeing what other materials around the home could be used to study Brownian motion. Here's a few suggestions to complement Maurice's article. A compound microscope capable of 200X or 400X magnification. Distilled water (the water collected from the ice box when defrosting the fridge is an acceptable substitute). One or more of: talcum powder, pasteurised milk. Milk is probably the easiest to try as it contains a fine suspension of fat droplets, many of a size to demonstrate the motion. Simply put the tiniest amount of milk on a slide and dilute with a drop of water. Diluting the milk makes the study of individual droplets easier. Cover with a cover slip and remove any excess liquid with a tissue. 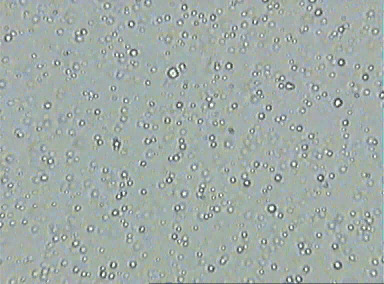 Focus the fat droplets (visible as tiny spheres suspended in the milk) with a 10X objective, then use higher powers of 20X and 40X objectives to study the droplets more closely. Initially you may see them streaming in one direction, this is not Brownian motion, just currents in the liquid. When the currents have subsided, you should see the droplets are still jiggling without moving in any specific direction .... this is the Brownian motion (also called Brownian movement) caused by the water molecules bombarding the much larger droplets. This bombardment causes the droplets to move in a random fashion. If you have dark field illumination you could also try this. I only have home-made patch stops which don't work too well at higher powers. I found there was a background glare caused by the many out of focus fat droplets, so you may have to dilute greatly to obtain a pleasing dark field effect. The animated gif on the right shows fat droplets in milk undergoing Brownian motion. Notice how the smaller droplets jiggle more than the larger ones and how some of them move out of the plane of focus and back again. The judder every 2 secs. is an artefact of the short video sequence being looped, as the fat globules don't end exactly where they started, even after this short time. This demonstrates an important feature of classical Brownian motion; the random molecular bombardment giving rise to the motion is responsible for diffusion. For example, smoke particles in a gas being spread from a region of high concentration to one of low concentration. Film clip details: Taken with a Russian 40X (N.A. 0.65) achromatic objective in bright field illumination. The image was projected into the video camera without an eyepiece. The milk was very dilute, just a needle wetted with milk, dipped and mixed into a large drop of distilled water on the slide. 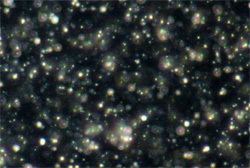 The droplets range in size from about 0.5 to 3 µm (1 µm is 1/1000th of a millimetre). Avi converted to gif image (248 kbytes) using Microsoft Gif Animator. The clip above just provides a flavour of Brownian motion. If of use, a longer, larger clip can be freely downloaded at the article foot. You can also try a suspension of talcum powder in water. Take a tiny amount on the tip of a pen-knife blade or small screw driver and put on a slide. Add a few drops of water to which has already been added a little washing up liquid. Mix the powder in and cover with a cover slip. Inspect as before. Many of the talc particles will probably be too large to show the effect, but there should be some particles fine enough to show the random motion. In the talcum powder I tried the fine particles were very small, less than 1 µm and showed the motion nicely. (The detergent improves the wetting of the particles, otherwise you may get clumps of talc). Any material suspended as very fine particles (i.e. a few micrometres in size or less) in solution should show the effect. Inks that are based on a suspension of pigments (e.g. India ink) rather than dye based should also show the effect, but may need diluting. The older microscopy books describe the use of finely ground gamboge suspended in water to study the motion. Gamboge is a yellow gum-resin used as a paint pigment. The motion is also observed in living organisms e.g. the cellular contents of filamentous aquatic algae, or as early microscopists observed - the particles suspended in the medium within living pollen grains. It's probably best to become familiar with the motion first in non-living material in order to more easily distinguish the motion from e.g. the movement of bacteria or cellular activity. - The botanist Robert Brown was the first to study the motion in 1827, although other researchers had noticed the phenomenon earlier. He was studying the fertilisation process in the plant Clarkia pulchella when he noticed the motion in tiny particles suspended within the medium of living pollen grains*. He went on to show that the motion occurred in non-living as well as living material. Some texbooks, even to university level, incorrectly state that he observed the movement of the pollen grains themselves. Most pollen grains are too large to exhibit noticeable Brownian motion. Clarification note added July 12th 2015. *The particles did originate from within the pollen grains but Brown made his studies on them when they had burst from the grains and released into the surrounding water. - Although Robert Brown is best known for his study of the motion now named after him, as a botanist he also made other important contributions to science. These included the recognition and naming of the nucleus as a constituent of living plant cells, and recognising the fundamental distinction between gymnosperms (conifers and their allies) and the angiosperms (flowering plants) (see e.g. Ref 1 and 2). - Early explanations attributed the motion to thermal convection currents in the liquid. It was not until later in the 19th century that correct physical explanations of the motion were formulated and Brownian motion was historically one of the first direct pieces of evidence for the existence of molecules. - Albert Einstein in 1905 derived a mathematical explanation for Brownian motion and integrated it into kinetic theory. - The French scientist Jean Baptiste Perrin (1870-1942) made a quantitative study of Brownian motion and derived one of the earliest estimates of the value of Avogadro's number. - Note added July 12th 2015. Many resources since ca. 1968 state that Jan Ingenhousz in ca. 1784 first observed what we now call Brownian motion prior to Brown in an inert substance based on Ingenhousz's reported study of finely ground charcoal suspended in uncovered alcohol. If Ingenhousz's original article is consulted, supported by repeats of his experiment, there is compelling evidence that this is a modern misinterpretation of what Ingenhousz was clearly showing, i.e. movement of all particles of any size in the currents caused by the rapid evaporation of the alcohol. His experiment was to demonstrate one of the benefits of using a coverslip (to reduce evaporation) and which he is correctly credited as inventing. A Micscape article in August 2015 was presented for an extended discussion and videos: The microscopical study of finely ground carbon suspended in uncovered alcohol as first reported by Jan Ingenhousz in 1784: Can replicating this simple experiment confirm that his own explanation of the particle motion was correct i.e. caused by evaporation currents and not the widespread modern reinterpretation as Brownian motion to give Ingenhousz priority over Brown? 1) 'Brownian movement in Clarkia pollen: a reprise of the first observations' by Brian J. Ford. The Microscope, 1992, 40 (4), pp. 235-241. This fascinating paper describes how Robert Brown's observations were repeated using one of Brown's original microscopes. This demonstration was carried out to dispel the suggestion that Brown's microscopes were not good enough to show the motion. The paper also discusses many aspects of Brown's life and work. This paper is on Brian Ford's web site. 2)'The Single Lens - The Story of the Simple Microscope' by Brian J Ford (Heinemann, London, 1985). Robert Brown used a so-called simple microscope for his studies i.e. a microscope with a single lens. This book includes a discussion of various aspects of the life and work of Brown as well as his microscopes. 3) Encyclopaedia Britannica (Micropaedia) or other large encyclopaedias, entry under 'Brownian motion' and 'Robert Brown'. (The former entry in the 15th edition, 1993 printing, incorrectly states Brown observed the motion in the pollen grain themselves rather than particles originally suspended within the fluid of pollen grains. *) *Clarification note added July 7th 2016. 'Originally' should have been added to previous sentence. Robert Brown observed the motion in the fine particles in Clarkia pulchella after they had been released from the grains into the surrounding water. Although he noted that in some pollen grains from species that were transparent to some degree, he could observe their movement within the grains. 4) 'Albert Einstein' by Banesh Hoffmann, Chapter 5, 'Atomic Agitation', Pub. Hart-Davis, 1973. 5) Microsoft Encarta entry under 'Brownian motion' and 'Robert Brown'. Higher quality video footage of Brownian motion. Click the still below to download a 3MB video of Brownian motion in avi format. (Video 15 frames/second lasts for ten seconds, in 384x284 pixels resolution. This can be freely used for personal and educational purposes but not further distributed or used commercially without permission from the author Dave Walker. Film clip details: Fat droplets suspended in milk. Taken with a Russian 40X (N.A. 0.65) achromatic objective in bright field illumination. The image was projected into the video camera (Panasonic CL350 430 line resolution) without an eyepiece. The milk was very dilute, just a needle wetted with milk, dipped and mixed into a drop of distilled water on the slide and covered with coverslip. The droplets range in size from about 0.5 to 3 µm (1 µm is 1/1000th of a millimetre). Comments to the Dave Walker welcomed. The author is an amateur microscopist living in England. Copyright www.microscopy-uk.net and their contributors. 'Home' of Amateur Microscopy on the Web! Disclaimer: all the information in this series is given in good faith. However, no responsibility is accepted for damage to property or injury to persons as a result of readers investigating the subjects described. It is up to the reader to judge whether the subjects can be safely viewed in their own home. Younger readers should consult their parents or teacher as appropriate before examining either their own or somebody else's property.